The world is hyper-connected. Over the past couple of years, organizations have established several networking setups with dozens of successful proofs of concept and even limited-scale network deployments. With the rise of the Internet of Things (IoT), businesses are now network-centric. Digital transformation is forcing companies to be agile and move with speed, and the network needs to be equally agile and fast. With the flow of that, the term Software-defined networking (SDN) can help modernize a company's IT infrastructure and business to keep pace with new technologies. On the other hand, CCIE is the world’s most prestigious and demanded IT certification which involves technical and practical knowledge of Networking. It is an expert-level certification which recognizes knowledge and experience in network infrastructure technologies. Let’s move on to understand SDN and CCIE in detail. 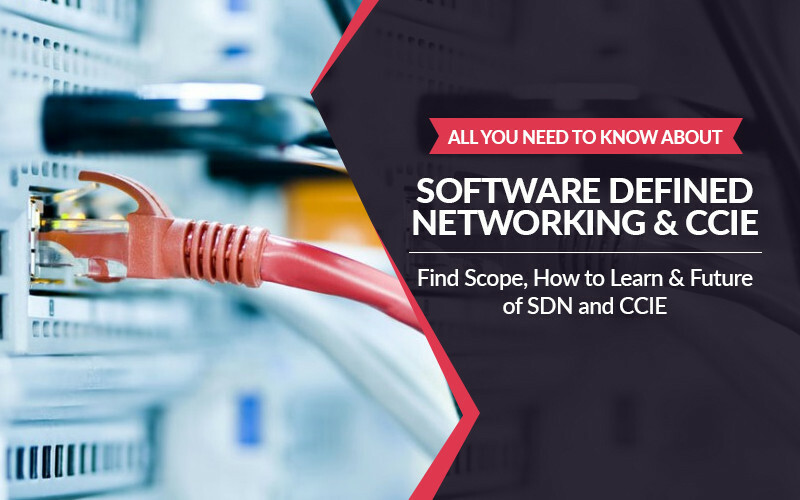 Software-defined networking (SDN) technology facilitates network management and enables efficient network configuration which improves network performance and monitoring. The static architecture of traditional networks is decentralized and complex while current networks require more flexibility along with easy troubleshooting. SDN is there to centralize network intelligence in one network component by disassociating the forwarding process of network packets (Data Plane) from the routing process (Control plane). The control plane has one or more controllers, which are considered as the brain of SDN network where the whole intelligence is incorporated. However, the intelligence centralization has its own drawbacks when it comes to security, scalability, and flexibility and this is the major issue of SDN. CCIE Routing and Switching was the first ever certification which was launched by Cisco Systems in 1993. Since the launch of this certification, it has been the favorite of all network engineers. CCIE Routing and Switching are not only about configuring network but also building the network fundamentals. To become a CCIE Certified professional, you need to pass 2 major Cisco CCIE Exams, CCIE Written, and CCIE Lab exam respectively. When you’ll pass both exams, you’ll get a magic number! Yes, that magic number will consist of 5 digit unique CCIE number which will be your identity as a CCIE. SDN is still an emerging technology, which promises many things in future. It has been attracting a lot of attention from service providers and IT industries. SDN has a great scope. It offers numerous benefits including on-demand provisioning, automated load balancing, streamlined physical infrastructure and the ability to scale network resources in lockstep with application and data needs. However, it does not seem to be implemented anytime soon by every IT networking company. And it is because of the complexities attached to it and expertise required to implement it. Also, all the underlying hardware will also need to be replaced before SDN can be implemented. As we have mentioned earlier, CCIE R&S is expert level certification where candidates gain expertise in designing, implementing and troubleshooting enterprise level networks. CCIE R&S gives you that magic CCIE number for which every network engineer dreams. Moreover, CCIE R&S certification opens up the path for further CCIE Certifications as well. There is a lot of scope in CCIE in India in 2018 for both freshers and experienced people. CCIEs are always in demand and IT companies like- Cisco, TCS, Orange, HCL, Tech Mahindra, HP, Wipro, Infosys, Accenture, Aricent, etc., welcome CCIE certified professionals with open arms. Should I do SDN or CCIE - SDN vs CCIE? SDN has no comparison with Cisco CCIE Routing and Switching. CCIE R&S course covers networking technologies, concepts, and protocols like OSI model, TCP/IP, BGP, STP, VLAN, VTP, MPLS, ACL, NAT, OSPF, EIGRP, and basics of network security. Whereas, SDN is not going to teach any of these concepts. There might be a case soon where Cisco release CCIE R&S version 6 and make SDN, a part of it. If you search Cisco website over the internet, they have not launched any certification related to SDN. How to learn SDN and CCIE? As far as learning SDN is concerned, it can be learned as and when required. Cisco is even adding SDN, IoT and many more technologies as part of their new CCIE R&S syllabus slowly and gradually. In future when SDN will become popular and getting implemented, old CCIE R&S, SP and Data Center candidates would have learned it already due to experience, and fresher candidates will be able to learn SDN as a part of CCIE R&S syllabus. Its going to be pretty interesting, exciting and positive in the future. Its not SDN against CCIE, its going to added in CCIE R&S syllabus as core strength. Whenever the new technologies are launched, it does not mean that old candidates with CCIE numbers have no use. There have been people who had done CCIE Routing and Switching course program 15 years ago. Those candidates are in the highest demand today because of their prominent experience skills. They did CCIE R&S very earlier which doesn’t mean they ceased learning after that. Actually, they kept on upgrading their knowledge and implementing all the new technologies. In fact, when MPLS was launched as a new technology, these were the only people who could understand MPLS and implemented it perfectly. If you do CCIE R&S now and when there will be engineers required to implement the SDN technology, you will be the first choice to implement, because you have already understood the underlying technology which is needed to understand and implement SDN. Cisco keeps on releasing new certifications every now and then (CCIE Collaboration and Data Center) but CCIE R&S certification is still in a huge demand. It has always been a king of all CCIE certifications and will be for the next 10 years for sure. Keep Following our blog for amazing posts from the world of Networking and Network Bulls Courses, Placements, CCIE Update & much more. To know more about Network Bulls Course and Career Counselling - Indian students can call us on our toll-free number 1800-313-2545 and international students can connect on +91-8745885377.